Set of two chaises. Powder coated aluminum frame. Sunbrella® upholstery. High density cushion. Sofa with Sunbrella® upholstery. Powder coated aluminum frame. High density cushion. End table with tempered glass top. Powder coated aluminum frame. Daybed with golden accents. Powder coated aluminum frame. Sunbrella® upholstery. High density cushion. Transitional in nature, the soft yet clean lines evoke feelings of uncluttered serenity. Transitional in nature, the soft yet clean lines evoke feelings of uncluttered serenity Transitional in nature, the soft yet clean lines evoke feelings of uncluttered serenity. Cast aluminum side table. Handcrafted lounge chair with grandly proportioned frame with artful floral detailing. 27"W x 33"D x 32"T. Aluminum frame with hand-painted epoxy/polyester/powder-coat finish. Polyester Suncloth® upholstery. Outdoor safe. Handcrafted left-arm chair with grandly proportioned frame with artful floral detailing. 26"W x 33"D x 32"T. Aluminum frame with hand-painted epoxy/polyester/powder-coat finish. Polyester Suncloth® upholstery. Comes with two 18"Sq. solution-dyed acrylic decorative pillows with spun Dacron® inserts that doe not hold water, mildew, or lose shape. Outdoor safe. Handcrafted chaise with grandly proportioned frame with artful floral detailing. 83"L x 28"W x 40"T. Aluminum frame with hand-painted epoxy/polyester/powder-coat finish. Polyester Suncloth® upholstery. Outdoor safe. Handcrafted coffee table with grandly proportioned frame with artful floral detailing. 42"W x 24"D x 20"T. Aluminum with hand-painted epoxy/polyester/powder-coat finish. Outdoor safe. Handcrafted occasional table with grandly proportioned frame and artful floral detailing. 20"Dia. x 20"T. Aluminum with hand-painted epoxy/polyester/powder-coat finish. Outdoor safe. Handcrafted dining table. 54"DIa. x 29"T. Aluminum with hand-painted epoxy/polyester/powder-coat finish. Outdoor safe. 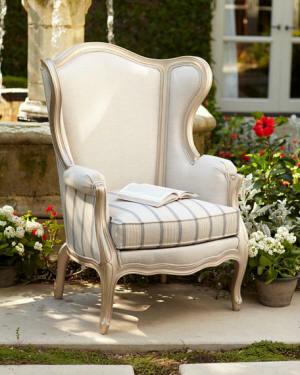 Handcrafted armchair with grandly proportioned frame with artful floral detailing. 25"W x 25"D x 36"T. Aluminum frame with hand-painted epoxy/polyester/powder-coat finish. Polyester Suncloth® upholstery. Outdoor safe. Handcrafted dining table. 40"W x 86"L x 29"T. Aluminum with hand-painted epoxy/polyester/powder-coat finish. Outdoor safe. Handcrafted dining table and chair sold separately. Hand-polished polyurethane frames with internal tubular steel structure for increased durability. Hand-painted automotive-grade finish; resistant to high and low temperatures. Outdoor safe. Chair with high-density, quick-dry cushions upholstered in Sunbrella® fabric Outdoor side chair with Sunbrella® upholstery. Handcrafted outdoor double-pedestal dining table. 88"W x 42"D x 31"T; designed to seat 8 people. Polyurethane base; wood top. Handcrafted outdoor chairs. Sunbrella® upholstery. Handcrafted armchair. Hand-polished polyurethane frame with internal tubular steel structure for increased durability. Hand-painted automotive-grade finish; resistant to high and low temperatures. High-density, quick-dry cushions upholstered in Sunbrella® fabric. Outdoor safe. Handcrafted bar stool. Hand-polished polyurethane frame with internal tubular steel structure for increased durability. Hand-painted automotive-grade finish; resistant to high and low temperatures. High-density, quick-dry cushions upholstered in Sunbrella® fabric. Outdoor safe. Handcrafted dining table and chairs. Hand-polished polyurethane frame with internal tubular steel structure for increased durability. Hand-painted automotive-grade finish; resistant to high and low temperatures. Outdoor safe. High-density, quick-dry cushions upholstered in Sunbrella® fabric. Handcrafted outdoor loveseat. 30"W x 42"D x 47"T. Sunbrella® fabric. Handcrafted cabinet. Crushed stone/polyester resin/fiberglass/styrene. Hand-painted aged-limestone finish. Two doors; one shelf. Outdoor chaise covered in Sunbrella® fabric. Handcrafted chaise lounge. High-density, quick-dry cushions upholstered in Sunbrella® fabric. Polyester. Outdoor safe. Handcrafted from durable cast stone material, stained to achieve the natural aged granite look. Looks like carved stone but weighs less. For indoor & outdoor use. Crushed Stone, Polyester Resin, Styrene, Fiberglass. Spray-painted Latex finish. An elegant pairing of golden framed chairs and a delightful trestle table turns al fresco dining into a stylish—and comfortable—affair. Outdoor sofa, chair, and ottoman sold separately. Powder-coated aluminum frames and weather-resistant polyester cushions for long-lasting outdoor use. Cushions are filled with quick-dry foam. Comfortable chairs and a simple table create the perfect setting for al fresco dining. Handcrafted chaise. Powder-coated aluminum frame and weather-resistant polyester cushions for long-lasting outdoor use. Cushions are filled with quick-dry foam. Outdoor chair and ottoman sold separately. Powder-coated aluminum frames and weather-resistant polyester cushions for long-lasting outdoor use. Cushions are filled with quick-dry foam. Handcrafted chaise. Powder-coated aluminum frame and weather-resistant polyester cushions for long-lasting outdoor use. Cushions are filled with quick-dry foam. The most welcoming outdoor spaces have all of the comfort and style of your home. Aluminum dining table. 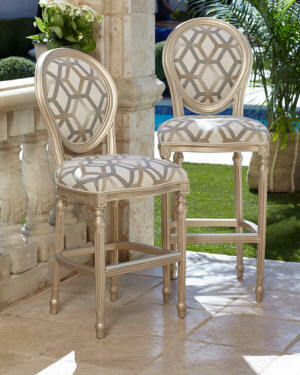 Dining arm chairs with elegant detailed frames, constructed of durable cast aluminum. Welted box cushions and all-weather Sunbrella® fabric. Designed inspired by European structures with architectural features. The excitement of a broad range of details, but also in its unique blend of highly functional statement pieces Taking a cue from the elaborate capitals of ancient columns, this table and bench form a perfect spot to savor a cool drink and admire your handiwork in the garden. Made of a resin composite material that is cast to simulate stone, with a weatherproof finish. This stand is just the thing to keep your umbrella upright and and your drinks in the shade, all while making a regal statement indeed Handcrafted console table. 60"W x 16"D x 33.5"T. Crushed stone/polyester resin/styrene/fiberglass. Latex finish. Outdoor dining table. 96"L x 36"W x 30"T. Hand-polished, sealed concrete. Thermo-ash top; finish patinas to gray over time. Outdoor safe. Crafted with a natural rattan frame and a stunning star-patterned weave beaneath a smooth glass top, this chic bistro table puts a modern spin on dining al fresco. Nothing says al fresco like classic bistro chairs. In checkered monochrome, ours pay homage to the sidewalk cafes of Paris - but look closely, and you'll spot an unexpected floral motif in the weave With a four leaf clover center, this natural rattan dining table appears to grow from the ground up, making it the perfect gathering place in your outdoor oasis. Made for outdoor use, this piece is crafted using weather-resistant materials in a high-performance finish. Natural and synthetic rattan. Sealed with clear lacquer for easy cleaning; it protects against moisture, but should be maintained Serving poolside sips is a breeze with this all-natural rattan bar cart. Complete with storage for bottles and glasses, glass shelves to house the essentials, and a wheeled construction, it's a summer-ready staple that's sure to be enjoyed for years to come Inspired by the classic bistro chair, this seat is just the right height for a poolside bar or kitchen island - while its artfully woven rattan casing lends a natural touch of texture to any space. A colorful addition to your sun room, patio, or terrace, this rattan seat is the perfect perch for hot summer days. Inspired by vintage French bistro stools, this colorfully woven seat is the perfect perch for hot summer days. A colorful addition to your sun room, patio, or terrace, this rattan seat is the perfect perch for hot summer days. Nothing says al fresco like woven bistro chairs. Crafted with a durable, natural rattan frame and modernly striped casing, ours bring a contemporary twist to a warm-weather classic. Make dinner al fresco even more romantic with this marble-topped piece - it's an outdoor-safe version of our beloved Seaford Pedestal Dining Table. Inspired by the classic bistro chair, this seat is just the right height for a poolside bar or kitchen island - while its artfully woven rattan casing lends a natural touch of texture to any space. Wide-striped upholstery rendered in bold, bright hues imbue this lounge-worthy seat with timeless summertime charm. An outdoor-safe version of our beloved Seaford Coffee Table, this marble-topped piece brings a luxe touch to your backyard or patio. Wide-striped upholstery rendered in bold, bright hues imbue this lounge-worthy seat with timeless summertime charm. Wide-striped upholstery rendered in bold, bright hues imbue this lounge-worthy seat with timeless summertime charm. This vibrant hammock is a lounge-worthy addition to a lush garden, airy deck, or poolside retreat. 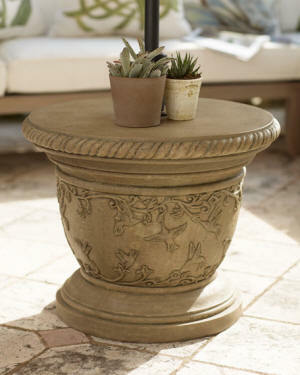 Boasting a gleaming finish and luxe marble top, this elegant side table elevates any outdoor space. Wide-striped upholstery rendered in bold, bright hues imbue this lounge-worthy seat with timeless summertime charm. Inspired by vintage flea market finds, this retro-chic chair is crafted with durable, weather-resistant materials in an easily stackable, storable silhouette. Inspired by a piece discovered in a Parisian flea market, a classic bistro stool The powder-coated finish of this bistro-style seat invites you to stay awhile and enjoy a leisurely beverage. Designed and crafted exclusively for terrain, this teak side chair reflects the elegant gardens of bygone eras. Each chair arrives finished with our Instant Grey + Teak Shield finish, which gives the wood a silvery, aged patina and prevents wear and tear from sun, heat, or rain A spacious addition to outdoor entertaining, this rustic dining table is constructed from solid, sturdy teak and hand-finished by skilled carpenters. Each table arrives pre-treated with our Instant Grey + Teak Shield finish, which gives the wood a silvery, aged patina and prevents wear and tear from sun, heat, or rain. Designed and crafted exclusively for terrain, this teak armchair reflects the elegant gardens of bygone eras. Each chair arrives finished with our Instant Grey + Teak Shield finish, which gives the wood a silvery, aged patina and prevents wear and tear from sun, heat, or rain. Made exclusively for terrain from reclaimed teak, this spacious dining table draws inspiration from antique styles Intricate, fretwork detailing and a smoky charcoal finish make this teak chair a sophisticated addition to the garden. Designed exclusively for terrain, this reclaimed teak dining bench draws inspiration from antique styles. Designed exclusively for terrain, this reclaimed teak dining bench draws inspiration from antique styles. Finished by hand, this traditional dining chair is made from natural teak and treated with an Instant Gray finish for a weathered appearance and years of outdoor durability. Our most spacious piece for outdoor dining, this trestle-leg table is constructed from solid, sturdy teak and hand-finished by skilled carpenters. Each table arrives pre-treated with our Instant Grey + Teak Shield finish, which gives the wood a silvery, aged patina and prevents wear and tear from sun, heat, or rain. This café style chair collapses for easy storage and transport, and comes in a rainbow of complementary hues that are perfect for mixing and matching. Topped with UV-resistant paint, the colors will remain bright and vibrant for years in the garden.